Some wall paintings are painted on large canvases, which are then attached to the wall (e.g., with marouflage). Whether these works can be accurately called "murals" is a subject of some controversy in the art world, but the technique has been in common use since the late 19th century. During the Middle Ages murals were usually executed on dry plaster (secco). In Italy, circa 1300, the technique of painting of frescos on wet plaster was reintroduced and led to a significant increase in the quality of mural painting. In modern times, the term became more well-known with the Mexican "muralista" art movement (Diego Rivera, David Siqueiros, or José Orozco). There are many different styles and techniques. The best-known is probably fresco, which uses water-soluble paints with a damp lime wash, a rapid use of the resulting mixture over a large surface, and often in parts (but with a sense of the whole). The colors lighten as they dry. The marouflage method has also been used for millennia. A fresco painting, from the Italian word affresco which derives from the adjective fresco ("fresh"), describes a method in which the paint is applied on plaster on walls or ceilings. The buon fresco technique consists of painting in pigment mixed with water on a thin layer of wet, fresh, lime mortar or plaster. The pigment is then absorbed by the wet plaster; after a number of hours, the plaster dries and reacts with the air: it is this chemical reaction which fixes the pigment particles in the plaster. 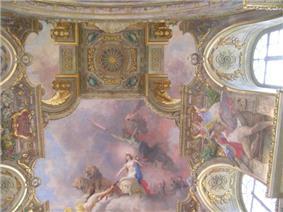 After this the painting stays for a long time up to centuries in fresh and brilliant colors. In 16th-century Europe, oil painting on canvas arose as an easier method for mural painting. The advantage was that the artwork could be completed in the artist’s studio and later transported to its destination and there attached to the wall or ceiling. Oil paint can be said to be the least satisfactory medium for murals because of its lack of brilliance in colour. Also the pigments are yellowed by the binder or are more easily affected by atmospheric conditions. The canvas itself is more subject to rapid deterioration than a plaster ground. Different muralists tend to become experts in their preferred medium and application, whether that be oil paints, emulsion or acrylic paints applied by brush, roller or airbrush/aerosols. Clients will often ask for a particular style and the artist may adjust to the appropriate technique. Murals can be a relatively effective tool of social emancipation or achieving a political goal. Murals have sometimes been created against the law, or have been commissioned by local bars and coffeeshops. Often, the visual effects are an enticement to attract public attention to social issues. State-sponsored public art expressions, particularly murals, are often used by totalitarian regimes as a tool of mass-control and propaganda. However, despite the propagandist character of that works, some of them still have an artistic value. 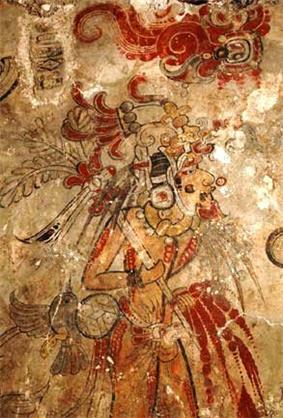 Other world-famous murals can be found in Mexico, New York, Philadelphia, Belfast, Derry, Los Angeles, Nicaragua, Cuba and in India. They have functioned as an important means of communication for members of socially, ethnically and racially divided communities in times of conflict. They also proved to be an effective tool in establishing a dialogue and hence solving the cleavage in the long run. The Indian state Kerala has exclusive murals. 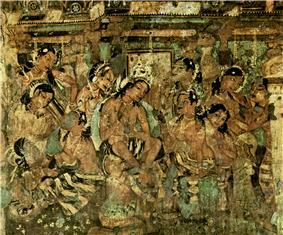 These Kerala mural painting are on walls of Hindu temples. They can be dated from 9th century AD. Many rural towns have begun using murals to create tourist attractions in order to boost economic income. Blakely, Georgia. In the summer of 2010, Colquitt will begin work on their Icon Mural. 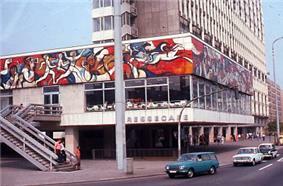 The Bardia Mural, photographed in the 1960s, prior to its damage by defacement and the ravages of time. 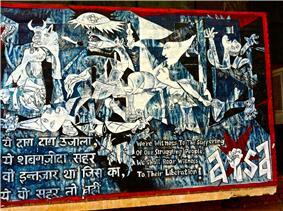 Communism wall painting in Jawaharlal Nehru University, based on Picasso's Guernica mural. The Mexican mural movement in the 1930s brought a new prominence to murals as a social and political tool. 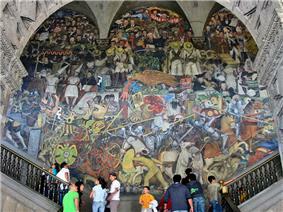 Diego Rivera, José Orozco and David Siqueiros were the most famous artists of the movement. Between 1932 and 1940, Rivera also painted murals in San Francisco, Detroit, and New York City. In 1933 he completed a famous series of twenty-seven fresco panels entitled Detroit Industry on the walls of an inner court at the Detroit Institute of Arts. During the McCarthyism of the 1950s, a large sign was placed in the courtyard defending the artistic merit of the murals while attacking his politics as "detestable." In 1948 the Colombian Government hosted the IX Pan-American Conference to establish the bogotazo tried to burn the capitol, but the Colombian Army stopped them. Years later, in the 1980s, with liberals in charge of the congress, they passed a resolution to turn the whole chamber in the Elliptic Room 90 degrees to put the main mural on the side and commissioned Alejandro Obregon to paint a non-partisan mural in the surrealist style. A not political, but social related mural covers a wall in an old building, once a prison, at the top of a cliff in Bardiyah, in Libya. It was painted and signed by the artist on April 1942, weeks before his death on the first day of the First Battle of El Alamein. Known as the Bardia Mural, it was created by English artist, Private John Frederick Brill. Many unknown and known artists such as Sardinia, is a most important center of murals politics. It is also common for mural graffiti be used as a memoir. In the book "Somebody Told Me," Rick Bragg writes about a series of communities, mainly located in New York, that have walls dedicated to the innocent lives lost. These memorials, both written word and mural style, provide the deceased to be present in the communities in which they lived. Bragg states that the "murals have woven themselves in the fabric of the neighborhoods, and the city." These memorials act as a constant reminder to the living community of innocent lives lost due to inner city violence. 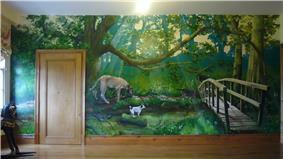 Public commissions of murals in schools, hospitals and retirement homes can achieve a pleasing and welcoming atmosphere in these caring institutions. 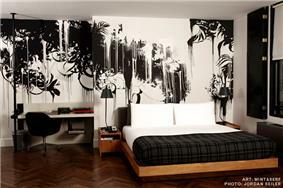 Recently, graffiti and street art have played a key role in contemporary wall painting. Such graffiti/street artists as Keith Haring, Shepard Fairey, ABOVE, Mint&Serf, Futura 2000, Os Gemeos, and Faile among others have successfully transcended their street art aesthetic beyond the walls of urban landscape and onto walls of private and corporate clients. As graffiti/street art became more main stream in the late 1990s, youth oriented brands such as Nike, Red Bull and Wieden Kennedy have turned to graffiti/street artists to decorate walls of their respective offices. This trend continued through 2000's with graffiti/street art gaining more recognition from art institutions worldwide. Mosaic murals are made by combining small 1/4" to 2" size pieces of colorful stone, ceramic,or glass tiles which are then laid out to create a picture. 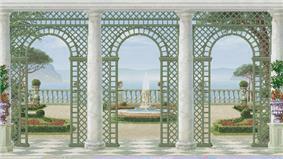 Modern day technology has allowed commercial mosaic mural makers to use computer programs to separate photographs into colors that are automatically cut and glued onto sheets of mesh creating precise murals fast and in large quantities. The azulejo (Portuguese pronunciation: , Spanish pronunciation: ) refers to a typical form of Portuguese or Spanish painted, tin-glazed, ceramic tilework. 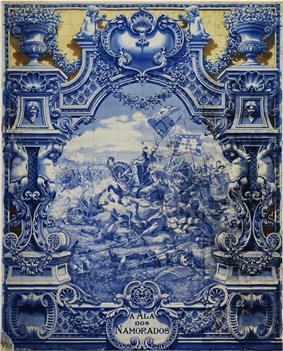 They have become a typical aspect of Portuguese culture, manifesting without interruption during five centuries, the consecutive trends in art. Orr C. Fischer, The Corn Parade, 1941, oil on canvas, Agriculture-themed mural on wall of post office, Mount Ayr, Iowa. ^ Clare A. P. Willsdon (2000). Mural Painting in Britain 1840-1940: Image and Meaning. Oxford University Press. p. 394. ^ Jorge Cuní, Pedro Cuní, Brielle Eisen, Rubén Savizki and John Bové. 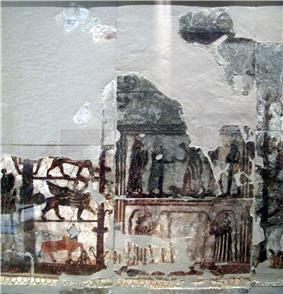 "Characterization of the binding medium used in Roman encaustic paintings on wall and wood". Analytical Methods. Retrieved February 2012. ^ "The Corn Parade". History Matters. Woods, Oona (1995). Seeing is Believing? Murals in Derry. Guildhall: Printing Press. Latzke, Rainer Maria (1999). Dreamworlds- The making of a room with illusionary painting. Monte Carlo Art Edition.